The foreign language editions of Wikipedia have long proven to be a useful way for me to research background details for posts on this blog, and now more Wikipedia users are going to enjoy similar access. Encouraged by the feedback we have received in the last 6 months, we are now happy to announce that the tool will soon be available in 8 Wikipedias as a beta feature. 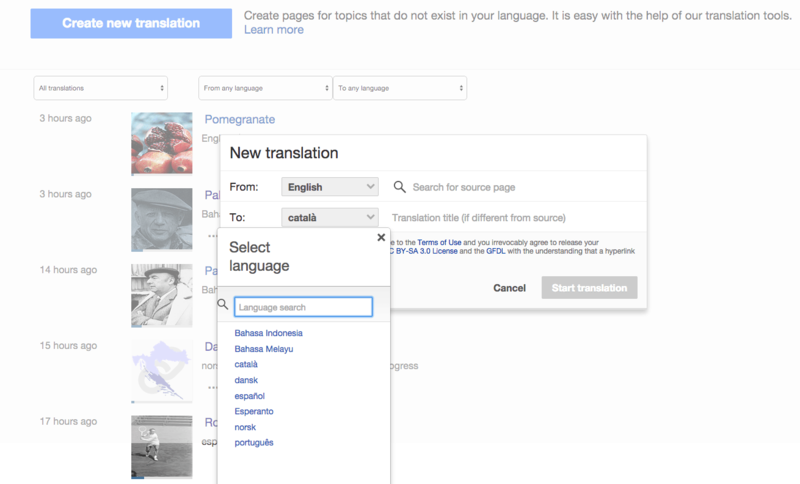 Users of Catalan, Danish, Esperanto,Indonesian, Malay, Norwegian (Bokmål), Portuguese, and Spanish Wikipedias will be able to use Content Translation from mid-January 2015. The tool will also be enabled on the Norwegian (Nynorsk) and Swedish Wikipedias, but only to facilitate their use as sources for Norwegian (Bokmål) and Danish respectively. Wikipedia users who read one of those languages will be able to translate any article on a Wikipedia site to one of languages mentioned above. The translations will be handled by Apertium, a GPL-licensed machine-translation platform. How do you translate text (asks the monolingual American)? It’s not the same thing, but when researching international musicians, it often helps to see if there are wikipedia pages in other languages about the same topic. Often the wiki page in the singer’s native language gives a lot more detail. We tend to assume that the English language wiki page of a topic tends to contain the most information, but for the arts, the information of the native language page trumps all (and in a pinch you can use a translation program to render it into your own language). Actually, that is exactly why I browse non-English Wikipedias. The best way to find more detail about (for example) a German company is to look it up in the German language Wikipedia.